Well, I dyed some more yarn to achieve a better set of value contrasts. Here is a picture with the results. Much better than what I had before. The Createx 'black' that I dyed in the lower right pushed to a lovely dark green. I also dyed a marine blue and a violet which came out quite close in hue and value. They were Createx dyes also. The Havana browns, from a procion dye, turned out to be lighter values than I expected. So not having enough low values I used up some leftover Rit dark brown to get the dark brown in the lower left. 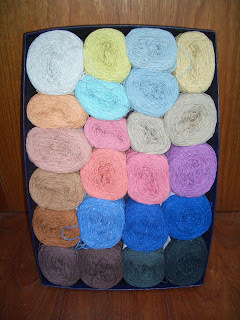 The upper left is a light blue grey which was the base yarn. It's a 12/2 silk which I cooked overnight at low in a crock pot per Sara Lamb's suggestion prior to dyeing. 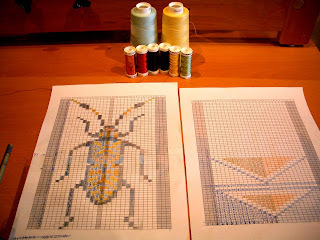 So now, all I need to do is warp my baby shannock tapestry loom at 10 epi and I am all ready for my tapestry workshop in March. Here are the first results of my dyeing using the leftover dyes from the Sara Lamb class I took last week. The yarn is 100% silk. The colors from right to left are yellow, turquoise, orange, scarlet and trash green. The photo is true to the colors...so what was called yellow turned out green. I assumed this happened since the silk was not white it was more of a blueish grey. Of course, there could have been contamination of the yellow - - it was a long and somewhat messy class! The trash green was an amalgamation of any dyes folks used which where greenish. They all went into one bucket. I also have some trash red...which I dyed the next day. I like the colors but was hoping for more contrast. Turns out all the colors I dyed are pretty much the same value. 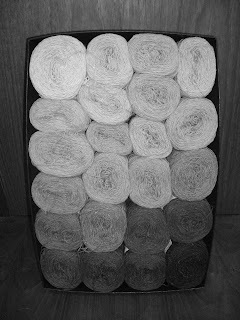 Check out the black and white photo of the yarns all balled up and ready to be woven. I will definitely need to dye up some dark colors before the tapestry class in March. I need a couple of high contrast colors. 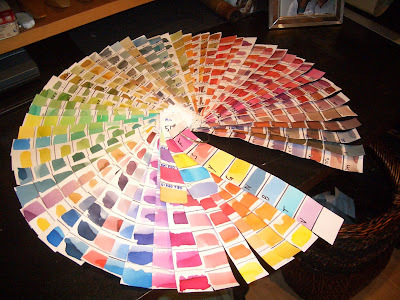 I am thinking of a rich purple and perhaps a dark green. Here are my completed dye samples from the Sara Lamb workshop I took this weekend. Quite a few samples for a day and half. I decided to put my samples on a key chain - like a painter's sample book. I find putting anything from a workshop into a notebook is the kiss of death. Once in that notebook on that shelf - all it will do is gather dust until we move. By putting the finished samples on a key chain hanging in plain sight I will now have another useful tool for my endeavors. 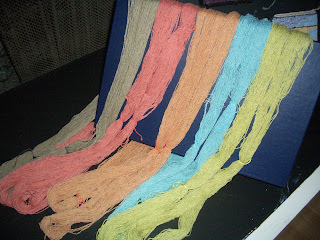 In lieu of painting a warp in the afternoon of the second day, I took some sample leftover dyes home. 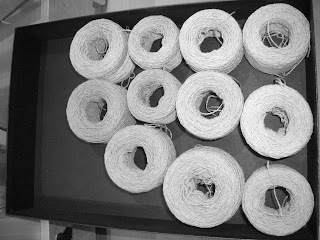 So, now it's time to dye up some tapestry yarn for the next workshop!